I have been trying to memorize sections of the Bible over the last seven years, though my efforts were off and on. Even though I have been undisciplined in sticking to it, Scripture memorization has help me. Verses run through me head all day, helping me as I deliberate about decisions, helping my prayer life, and helping my teaching and preaching. The only regret I have about this memory work is that I have not consistently done it. Three years ago, I discovered an invaluable resource: Memverse.com. 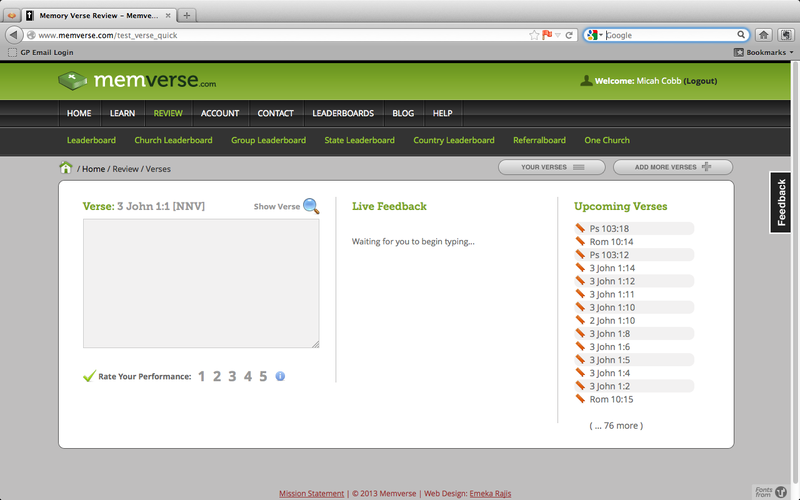 On Memverse, you can create an account and track your memory work. Once you have an account, you choose the verses you want to memorize. Then you just log in every day, go to the Review tool, and work on the verses that you are scheduled to memorize that day. When reviewing verses, it groups verses together if they are from the same passage. This way you review John 3:17 right after you review John 3:16. It really helps you learn passages rather than just individual verses. A “Learn” mode, which round after round replaces words in a verse with blanks, so that you start reviewing the verse with it only having one or two blanks. By the tenth round, you are faced with nothing but blanks, but you are well prepared for it by this time. Several leaderboards, so you can see how you are doing stacked up against the other members. It also compares churches with churches (when you register, you tell them your church’s name and location) and state with state. Several translations to choose from. A “Chapter Review” mode, where you can review an entire chapter at once. It is free to create an account and start memorizing. There is no paid memberships to the site, so you get all the features for free. I hope you’ll consider using the site. Just in case you do, here’s some advice that I’d give you to make the best use of it. Early on, focus on completing sessions every day. Don’t worry about the number of verses memorized. A verse is defined as “Memorized” when your interval between scheduled reviews (when you get a verse right, the interval is increased) reaches 30 days. You have to review it correctly several times – it differs based on several factors – to reach that threshold. So it’ll take you a few weeks of work before you ever memorize a verse. That can be frustrating. So just focus on completing review sessions every day. Trust the system. Pick a translation and stick with it. 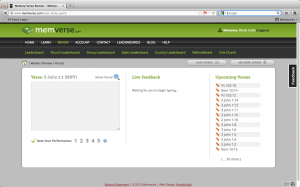 Memverse.com has a lot of Bible translations to choose from. But you cannot switch from one translation of a verse to another without starting all over with that verse. Say I’d memorized a lot of verses in the NIV 1984 translation. If I want to re-memorize my verses in the updated NIV (2010) version. I’d have to deleted all the verses – losing all my stats relating to those verses – and add again all theses verses, this time in the new translation. I understand why they do it this way. After all, the translations differ enough to complicate memory work. So it’s best to treat each translation of a verse differently. But this could be frustrating if you’re not initially prepared for it. So go ahead and join. You won’t regret it.